Metal from Chile is not exactly common, and apart from Criminal, who have relocated to England, I can’t think of any bands from this South American country. This has changed now with Capilla Ardiente, a duo from the capital city Santiago. Claudio (bass) and Felipe (guitar, vocals) hired a second guitarist and a drummer to record their Solve Et Coagula that comes as vinyl EP containing one song on each side. Solve is nearly eleven minutes long, while Coagula makes it easily over thirteen minutes. Both pieces start out really slowly, build up tension and contain enough variation to keep the listener’s attention uninterruptedly. Capilla Ardiente have taken inspiration from the doom scene of the early Nineties, reminding of bands like Solitude Aeturnus and Count Raven. The vocals have a lot of presence, and especially during the more dramatic moments they remind of former Candlemass singer Messiah Marcolin. Both tracks, while not sounding the same, are equally great, even though I slightly prefer the longer Coagula. 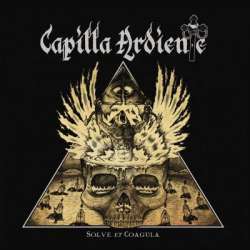 Capilla Ardiente act perfectly and offer purest doom metal. Despite the slow pace, their music is full of suspense that will get you to listen to their EP again and again. True doom fans have no excuse to skip on this limited record that comes 400 times in black vinyl and, for the collectors, 100 times in golden vinyl.